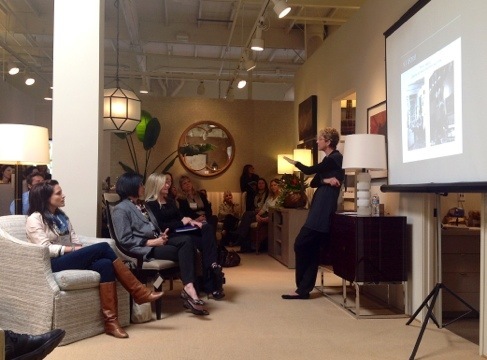 This Wednesday, I had the pleasure of hearing interior designer Victoria Price, Vincent Price’s daughter, speak on staying inspired. Her lecture was titled “Tell Me, What Do You Have in Your House?”, but it could have easily been titled “Be Yourself and the Design Will Follow”. One of the things she said which resonated most was, “don’t be afraid to be yourself with your clients.”. She didn’t mean show up to a meeting dressed in torn yoga pants, scarfing a bag of salt and vinegar chips (not that I ever do either of those things – ahem). What she was trying to get across was how important it was to embrace the style and sensibilities that are authentically you, and then express your enthusiasm for them to your clients. I’m certainly more myself in my work every day, but I believe I could be even better with a little more contemplation, so I will be working on a list of things that I truly love in design and sharing them on down the road with you. Meanwhile, what would be on you list?